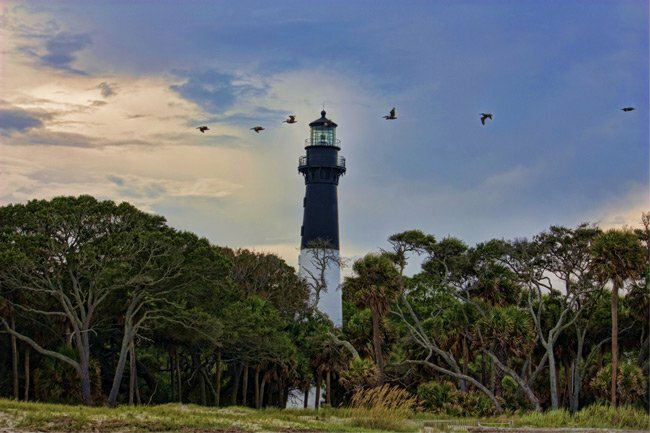 Hunting Island in Beaufort County received its name because it was once used for hunting deer, raccoon and waterfowl. The lighthouse keepers and their families likely enjoyed the abundance of wild game, but they also raised hogs, chickens, and turkeys and tended a garden as well. 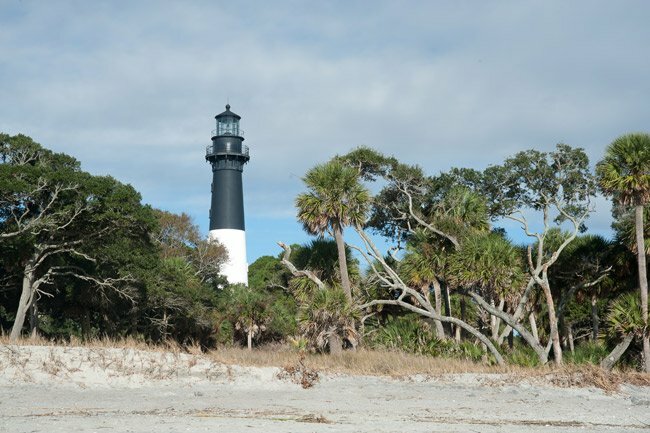 The original Hunting Island lighthouse was built in 1859 but was destroyed in the Civil War. It was rebuilt in 1875 of removable cast iron plates that so the structure can easily be moved and rebuilt if necessary. In 1889 erosion led to the lighthouse being dismantled and relocated a mile and a quarter to its current location. The lighthouse remained active until 1933. 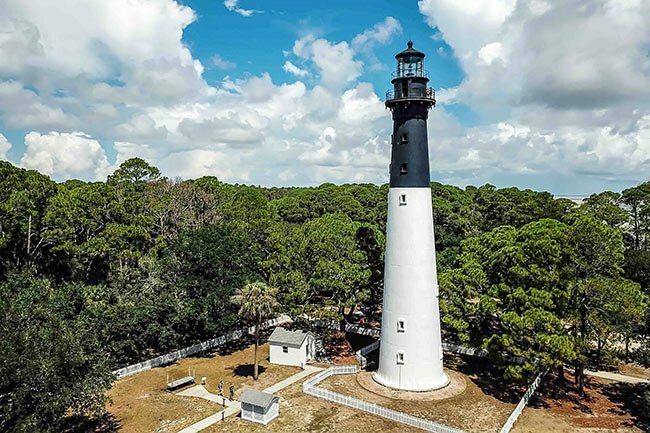 Currently, the Hunting Island Lighthouse is the only historic lighthouse in South Carolina that allows visitors to climb to the top. 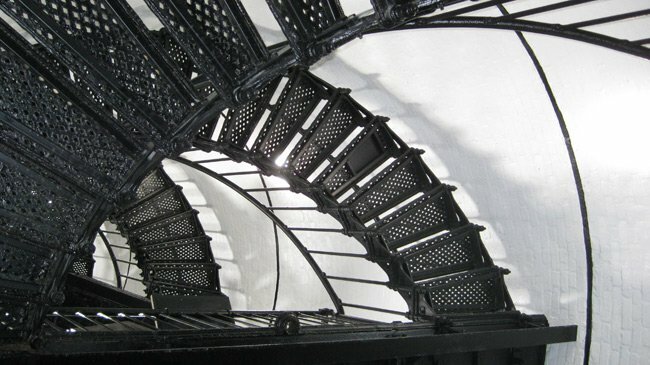 Within the lighthouse are 167 steps that take visitors to a breathtaking view of the island 132 feet in the air. Unfortunately, the Atlantic Ocean washes away several feet of shoreline each year. Today, the tower stands 400 feet from the high water mark. If erosion continues at its present rate, the lighthouse might need to be once again moved further inland. One of the sea islands near Beaufort, Hunting Island has lush, unspoiled vegetation and wild beauty. It was formerly accessible only by boat, but is presently connected to the mainland by a bridge and causeway. The original lighthouse, a wooden structure built about 1859, was destroyed by beach erosion. In replacing the lighthouse, the US Coast Guard built a tower 136 feet tall. Made of cast iron plates, this was located about ¼ mile from the shoreline, and was designed for relocation if necessary. The new lighthouse complex, completed in 1875, included the keeper’s dwelling, a fire-proof oil house, and several other storage buildings. By 1889, the sea had cut away the northern end of the island, and did necessitate relocation of the lighthouse to its present site, 1 ¼ miles south of the old site. 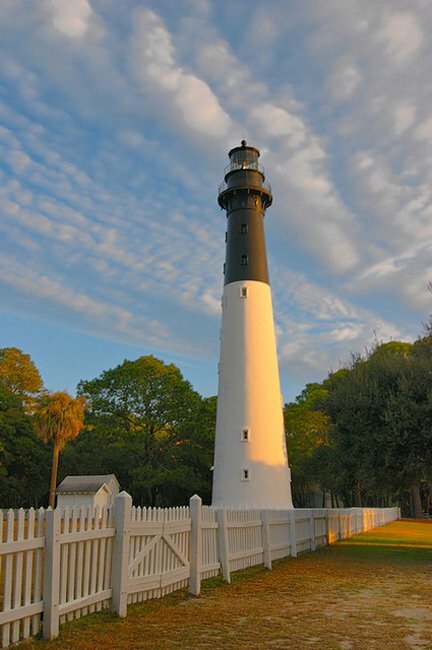 Before its abandonment by the US Lighthouse Service in 1933, Hunting Island Lighthouse cast a 120,000 candle power beam out to sea. There’s a light burning on the top of the lighthouse! When was this added?